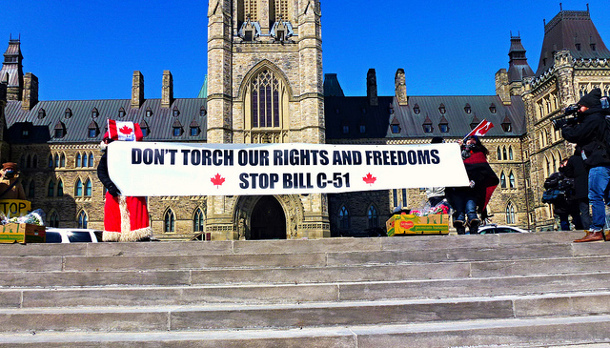 Ottawa – On the eve of the vote on Bill C-51, the 43 member organizations of the International Civil Liberties Monitoring Group appeal one last time to members of Parliament to reject this unnecessary piece of legislation that, while failing to protect Canadians, rolls back the rule of law and threatens fundamental rights and freedoms enshrined in the Canadian Charter of Rights and Freedoms. The final vote in the House of Commons on Bill C-51 is scheduled to take place on Wednesday afternoon after the government passed a motion on time allocation cutting the debate short on a very important piece of legislation, yet again. The ICLMG coalition was created after the adoption of the Anti-terrorism Act of 2001 out of concerns for civil liberties in the context of the so-called war on terrorism. The coalition’s concerns regarding Bill C-51, the Anti-terrorism Act of 2015, are even greater: the new powers given to CSIS to disrupt, without an increase in oversight, which is already inadequate; the new warrant system asking judges to allow violations to the Charter of Rights and Freedoms; the facilitation of information sharing with foreign governments; the potential negative impact on free speech and dissent; the overbroad definition of threats to national security; the absence of a clear mechanism to challenge an inclusion on the no-fly list; secret judicial hearings and the permitted use of secret evidence; the non-respect of recent Supreme Court rulings; and the lowering of the thresholds for preventative arrest and peace bonds. The ICLMG asks that the bill be withdrawn or significantly amended. This entry was posted in News from ICLMG on 5 May 2015 by ICLMG CSILC.